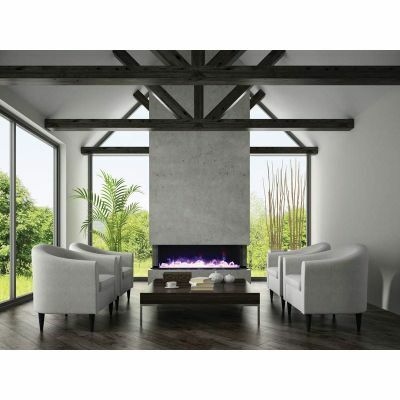 Amantti’s stylish 72-TRU-VIEW-XL 3 sided electric fireplace is a true fireplace innovation! The stunning flame presentation and unique media options can now be viewed from almost any angle. Four installation options: 3 sides open, left side open, right side open, both sides ‘closed’. Designed for building materials to finish right to glass. Available in 50”, 60” and 72” width models so that you will find a fireplace that is perfect for any space inside or out. Boasting a depth of 14 1/4”, the 72-TRU-VIEW-XL features two flame sets, ambient canopy lighting in 13 colors and three color LED light strips allowing for a multicolor flame presentation. With just a click of the remote control, choose from blue, rose, violet, yellow or orange colored flames.